Next up for the Spanish World No. 2 will be local hero Alex de Minaur. Angelique Kerber advances in the women's draw. Maria Sharapova sets clash with Caroline Wozniacki. World No. 2 Rafael Nadal headlined Wednesday’s night session on Rod Laver Arena, taking on an Australian for the second straight round. The 32-year-old Spaniard remained untroubled to beat Matthew Ebden 6-3, 6-2, 6-2 in one hour and 56 minutes. 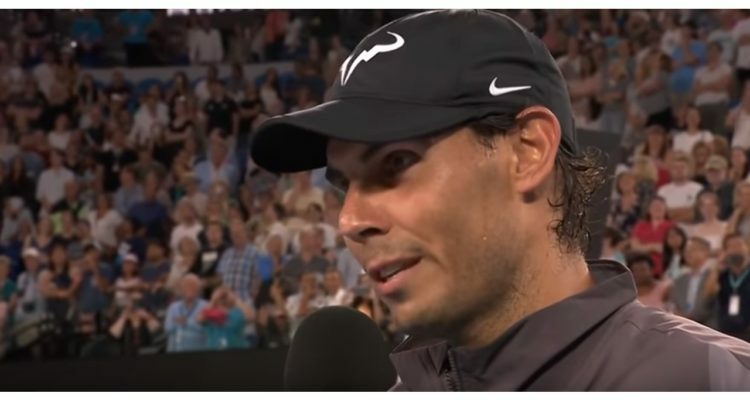 Nadal recorded his 57th match-win at the Australian Open and claims sole ownership of third place on the list for most victories in Melbourne in the Open Era, ahead of Stefan Edberg. “Today has been a very important step forward for me. The way that I played was very positive, in my opinion. I am happy about the rest of things. The seeds are seeded because they played better the last 12 months – that doesn’t mean they going to play better during these two weeks. When they lost, there is another player that is playing better, that’s all,” Nadal was pleased with his performance. Alex de Minaur continued his great run of form by reaching the third round in Melbourne for the first time and equalled his best Grand Slam performance. It might have taken him the best part of four hours but the Australian young gun is rightly delighted to come through a real challenge from Swiss qualifier Henri Laaksonen winning 6-4, 6-2, 6-7(7), 4-6, 6-3. There are high expectations of De Minaur, who won his first ATP Tour title in Sydney last weekend, and he will take on one of the sport’s greats in front of what will be another packed house on Friday. “It’s going to be incredible, just to be able to step out on court with him. I can’t wait to go out there, try and compete and just give 150 per cent,” De Minaur was quoted on the Australian Open website. “I got the chance to play him in Wimbledon on Centre Court. I feel like I learnt a lot from that experience,” said the home charge, who won just seven games last July. World No.2 Angelique Kerber became the eighth active player to reach 100 Grand Slam wins. The German, who will turn 31 on Friday, emerged victorious from an all-leftie-encounter with Brazilian qualifier Beatriz Haddad Maia 6-2, 6-3 on Rod Laver Arena earlier in the evening. Kerber will next be challenged by Australian wild card entry Kimberly Birrell. Maria Sharapova defeated Rebecca Peterson of Sweden 6-2, 6-1 in the last match on Margaret Court Arena. The former World No. 1 will next meet defending champion Caroline Wozniacki. “That’s a tough third round for me. She’s the No.3 seed at the moment and the defending champion. It’s no secret that she loves playing here and loves the conditions. It will be a tough one, but I set up the challenge, so I’m willing to go out there and take it,” Sharapova said. This entry was posted in Australian Open, Grand Slam and tagged Australian Open, Grand Slam, Rafael Nadal.